Usually the normal planting time around here is around Mother's Day. I got a little bit of a late start, and only part of it is my fault! We had some late snows this year, well into May, then we got busy, then Memorial Day weekend happened, and, well, life happens. So my garden didn't get planted until May 28th. At least it wasn't June! I have some concerns since I'm using seeds from last year, but I've been storing them in a cool, dry place, so they should still be good. I created a spreadsheet showing the date planted, germination time, and time to harvest as a planning aid (I AM an engineer), and as the germination dates passed I began to freak. I don't know if it's because the temperature climbed so high, up into the 90's already, or if it's just my brown thumb.The zucchini, which should have been the last to sprout, was up early. I haven't seen hide nor hair of any carrots or beets. I've got some corn, some beans, and some peas. The cucumbers, lettuce, and canteloupe are going gangbusters. Wahoo, pickles! I've been watering every day, after I get home from work. I change my shoes, open a beer, and pick up the hose. I'm not sure why beer and gardening go so well together, but they do. Normally, Shiner Bock is my gardening beer, but last week when it was in the 90's I chose to switch to my lawn-mowing beer, Karma, from Avery Brewing Co. What is lawn-mowing beer, you ask? Lawn-mowing beer is light and refreshing, best served cold, and allows you to drink it down while still keeping the lines on the lawn straight. For the young or un-initiated, that might be Miller Light or PBR. For those of us in Colorado, we reach for a nice microbrewed pilsner or Belgian pale ale. Karma fits the bill for me. While the garden is hit and miss so far, the lawn is definitely expired. There's no coming back from dead, and there's no resodding while we're on water restrictions (again). I've wanted to replace the front lawn with a perennial garden anyway, and figured now's my chance! So for a carefully compromised budget, I was able to purchase about 50 plants at Harding Nursery, which specializes in perennials that can survive in Colorado. 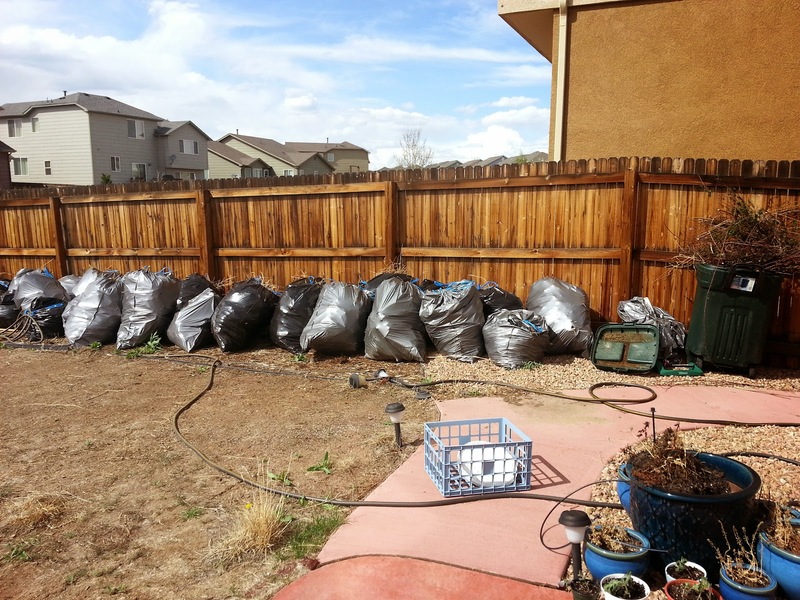 Some of the 37 trash bags that were filled. We cleaned up the yard first, one weekend in May, getting rid of 'most' of the weeds. We're still putting bags out with the trash each week because we had so many! We didn't have time to plant immediately, so the plants sat on the front porch for a week. I had my fingers crossed the whole time that someone wouldn't steal them. Mr. HPL (High Plains Life. I have to call him something.) helped with the tilling and the digging holes thing (you know, the hard labor), while I researched and planned the design, picked the plants, and made the final decision as to where everything would go. I tried to stick to a bright color palette, that would stand out against all the rocks and grey "bleh" that is our neighborhood. I wanted reds and oranges, blues and purples, not the whites and pastels that I thought would just blend in and disappear. I tried to get plants that bloomed at various times, so that I would have flowers from early spring, through summer, to fall. Some of them will bloom all season, and those I think of as my workhorses. The plan on paper . 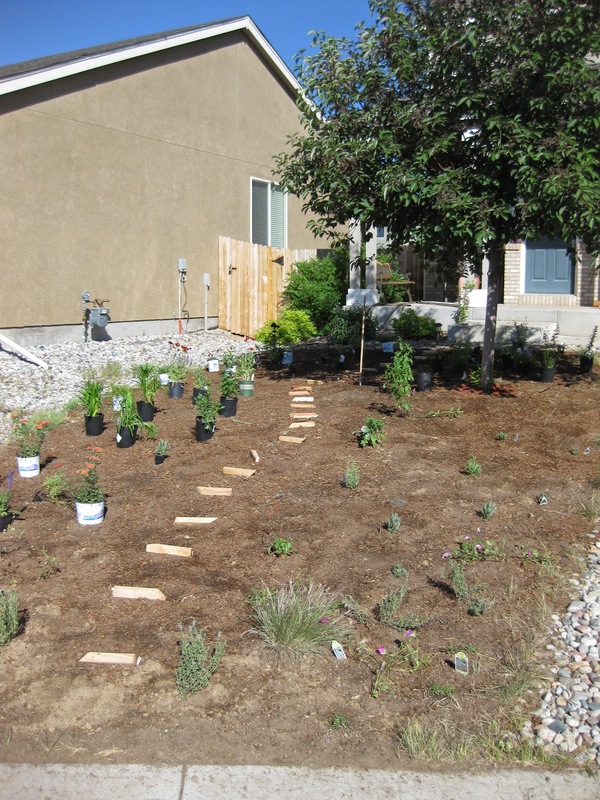 . .
the front yard I was planting did have a sprinkler system, but I wanted to reduce my water consumption, and I already told you how sandy the sand, I mean soil, is, so I chose plants that could handle moderate to xeric conditions. It was a lot of work, and I put a lot of thought into it. I also admit to cobbling together ideas from some of the pre-planned gardens offered through High Country Gardens. They are a wonderful resource. What do you think? We could definitely use a few more plants to fill the space in quicker, but there's that pernicious thing called a budget. The ground covers will fill out and spread a bit more, some of the flowers will reseed and spread, and all of them will just get bigger. That's the whole deal about growing things. They grow. I really like how everything turned out, and am pretty impressed with my landscape design skills, if I do say so myself. Now, to keep it all alive. Today the front yard, tomorrow, the world.